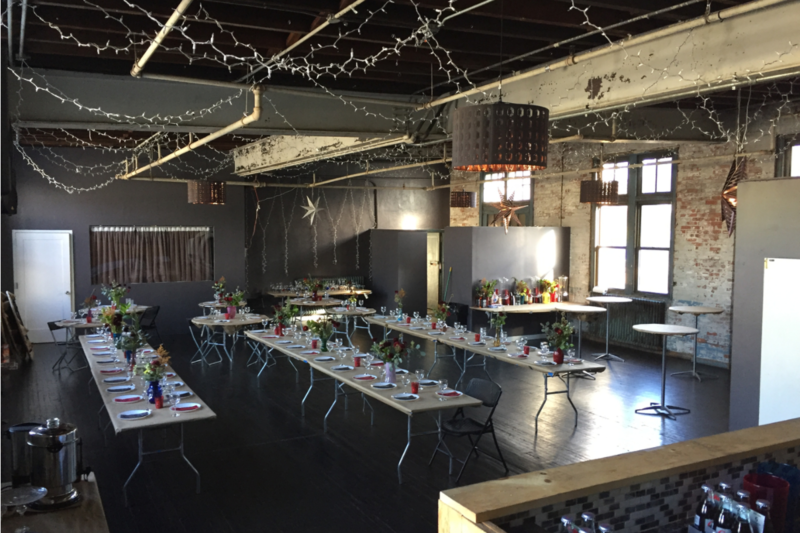 Rent Loft 172 | Corporate Events | Wedding Locations, Event Spaces and Party Venues. We are an Event Space in Williamsburg Brooklyn that caters hip consumers.The space can be used for parties, expos, commercials, music videos, fashion and advertising photography. •	Full Kitchen with Oven/Stove, Fridge Freezer, Microwave. it has a private entrance that is accessible by a pin code on a secure keypad. It consists of a large party room that has tall 13 FT ceilings, 1 smaller rooms that can be used for storage, Coat Room, or meeting space, a large kitchen that has state of the art stainless steel appliances, three bathrooms (2 Unisex, 1 Men Urinal), Outdoor Roof-Top deck that is accessible from the loft. The space can accommodate up to 100 people sitting & 140 people standing. The space is available for setup from 11:00am on the morning of the booked date. The event needs to end at 12:00am. The space is available for setup from 11:00am on the morning of the booked date, the event needs to end at 12:00am. If you need extra time for setup please make sure to book extra hours. The space is available for setup from 11:00am on the morning of the booked date. We require a $500.00 refundable security deposit for every event hosted in our space. The Security Deposit method is only accepted in Cash. The Security Deposit will be refunded within 3 days of your event. We reserve the right to keep the Security Deposit if any of our rules are not followed 100%, or if any theft or damages occurred to the space. If we don’t receive the security deposit 3 days before your event, we reserve the right to cancel your event. We only reserve the space for you once we have received a 50% deposit. Full payment is required 30 days before the event date. You may cancel your reservation up to 30 days prior to your event, and will receive a full refund. If you cancel within 30 days of your scheduled event we will not provide you any refund. What is included is this fee? The price includes the entire event space + The Rooftop. No personnel are included with the space rental, we are available to assist you if any urgent matter arises. If you want us to have a dedicated person from our management at your event the fee will be $50 per hour. We don’t provide catering service, we work with many local caterers and allow you to bring any caterer of your choice. We have a sound system that allows you to hook up an iPod type device or laptop to play music. Included in the price are the following items. (80) Folding chairs, (10) 6FT Folding Tables, (6) 8FT Folding Tables, (12) Cocktail Tables, Portable Bar. If you need additional Tables & Chairs, it can be rented locally at very reasonable rates, we can facilitate the delivery and pickup. We don’t have a NY State Liquor license, if you plan to serve Alcoholic beverages it is your responsibility to arrange that with your caterer. We are here to ensure that you get the most out of this space; our dedicated staff will make sure that you are 100% satisfied.